Lizzie Lenard Vintage Sewing: What is Vintage Sewing? And apart from about ten terrifying minutes at school in the 1960s, I have never used one. Therefore I make everything using vintage sewing machines. In recent years I have accumulated a few machines, and have done my best to put them to good use. My newest machine (in both senses, being my my most recent purchase and the most recently manufactured) is a 1949 Singer 15K hand machine. In 2011 my husband and I set up a Youtube channel, starting with a couple of videos showing how to thread the machine that I had learnt to sew on, an 1897 Singer 28K. Our son said nobody would be interested. He now cheerfully acknowledges that he was well wide of the mark. 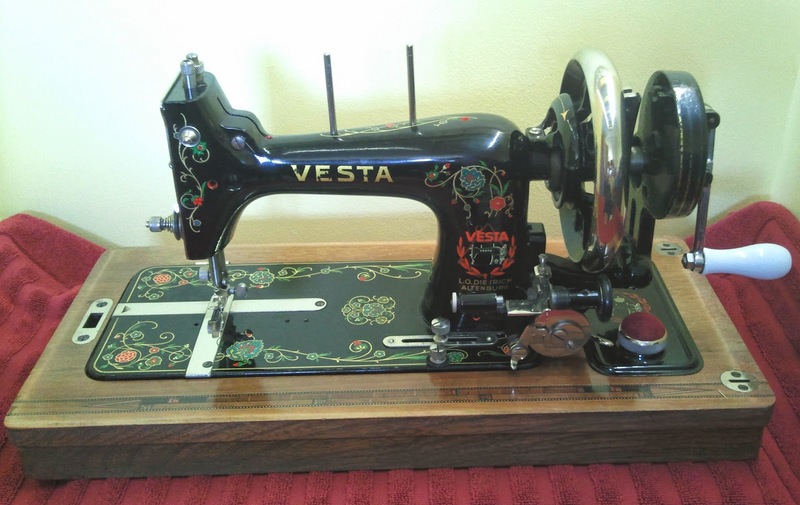 Just for fun, here is a video of my prettiest machine a Vesta Transverse Shuttle dating from about 1936, with music specially composed by our son. He recorded the sound of one of my machines stitching to use as the basic rhythm, and composed a theme around it. For clothes I like cotton poplin prints. For quilts, the more I do free motion quilting, the more I enjoy using the plain strong colours and shot cottons from Oakshott. I tend not to use prints that are up to the minute hot and trendy because they can date a piece of work to within five years or so. I use no glue, spray cans (starch, glue etc), fabric markers, iron-on interfacing, non-woven interfacing, synthetic threads etc. etc - all the sort of products I see recommended in books and magazines, online, in shops and just about everywhere. My reasoning is that if people could make fabulous clothes and quilts, say, in the 1930s, with just straight stitch machines and plenty of practice and knowhow, then so can I.
Fortunately, I was well taught at school back in the late 1960s and early 1970s. I learnt how to do French seams, felled seams, bound seams and other similar techniques, so it is second nature when making clothes to leave no raw edges in sight. Thanks to all the inspiration and information on the internet I have branched out from making clothes to making quilts as well. To learn piecing techniques, I spent hours poring over Bonnie Hunter's free scrap quilt patterns on Quiltville. Bonnie, in turn, when she started piecing on a treadle, found one of my Youtube videos helpful and featured it on her blog. After learning the basics of piecing, I decided to try appliqué. Appliqué was a challenge, but I worked out how to do it using the sewing machine. First I make a paper stencil from the pattern, then with the machine I follow the lines of the stencil to stitch the material to be applied to the background material, and only at the end do I actually cut out the shape as I stitch around it by hand in blanket stitch. For want of a better name, I called this method Vintage Sewing Machine Appliqué, and if you click on the heading on the sidebar you will find posts showing how I add stitched decoration with the machine, and how I quilt around it. My methods paid off when I entered my Queen's Diamond Jubilee Quilt into the quilt show at Malvern in 2013 and gained my first ever ribbon. Since then I have been working hard at free motion quilting, having initially taken the cue to get started form Leah Day's videos, and this wonderful lady on Youtube. Congratulations on your new machine, Joyce! I am sure you will have hours of pleasure with it. Hi Lizzie, bought my very first sewing machine this week, a 1909 Singer 66. Model!!! Thank The Lord for your "how to treadle" tutorial!!!!! Great news, Karen. Have fun with your machine! I bought a Vesta hand crank machine at Ardingly. What's the best way to find out how old it is? It came with lots of bits and bobs -- and a complicated bobbin winder I can't figure out. Where's a good source for a manual? Love the video. As for bobbin winders, click on the heading Bobbin Winders on the sidebar on this blog and you will find several posts about German bobbin winders, so I expect you should be able to work out how your machine's winder works. could you advise where you got the feet for your vintage machine. I am having difficulty finding any. Your story is fascinating. No frills, just like it used to be. And a whole collection of beautiful machines. You're keeping the history of sewing and quilting alive. Perhaps a book in the future? A book... now there's an idea. I would buy it! :) I have a wide variety of machines, and funny enough, the newest ones give me the most trouble. I just made my girls (and their dolls) matching aprons using my New Home treadle. It was a bit entertaining at times, but so much fun! I much prefer it to the motorized ones! It sounds like a great machine, Sue. Enjoy the blog! Love your tutorials but since I am new at sewing, especially on vintage machine could you tell me if its possible to make a reverse stitch,like a safety stitch, on a vintage sewing machine. Its a singer 87 years old..thank you in advance..
Few old machines do a reverse stitch. I have only seen it on some German machines and a Vickers, and not on Singers. I have lived without reverse all my sewing life. You really don't need it. Just turn the work round and go back the way you came. I'll be the first one since my grandmother to use a non-electric machine, but I'm looking forward to getting used to the treadle and learning about its inner workings. You're a great resource to that end! You have hours of fun ahead of you! Aren't you glad you never got rid of that old machine? Nothing beats the satisfaction of making items with a machine you have restored yourself. Yes, it's quite lucky my one sister hates to get rid of old things, otherwise it may have been sold in a garage sale several years back! There's some crackling of the japanning and a few rust spots, but after managing to slide the needle plates off and finding the bobbin and bobbin case inside, I'm feeling a bit more optimistic about this project. I think the only parts I'll need to replace will be the leather belt and maybe the tension spring. Very much enjoy watching the videos. I have used your videos to learn to do a fair amount with my little 99K hand crank - the booklet seems to be a little too small for my eyesight even with specs! She was in perfect condition, just a little oiling. I now have a treadle and a 15K80 which needs a bit more of a brush up, but otherwise seems to be OK - I have already got the cleaning equipment at the ready! Also found Helen Howes to be invaluable - and funnily enough Leah Day was my first inspiration into machine quilting - hand sewing takes way too long! Thank you so much, Kerry - great to hear from you, and every best wish for Christmas! Greetings, I am retired and new to vintage sewing machines. My first one was a 1930 Vickers that had floated around in a flooded basement for a week, Thank goodness the bentwood top was airtight. The base fell apart and the thick oil film on the base preserved it. Everything else cleaned right up. It sews like a charm and anything that fits under the foot, I don't have it anymore, a close friend brought her plastic offshore thing over again for me to fix, it hurts too much to call it a sewing machine, being a single mother she can't afford anything so I gave her an "old" one I had. Showed her how to oil it etc. The second machine is a 1924 Singer 128, the third is a 1956 201K, the forth might be a Singer 191J possibly. really enjoyed your site. A floating Vickers - now there's a miracle! I am so pleased that you have enjoyed reading the blog. These old machines are such an immense pleasure, worth every minute that you spend cleaning them up. If there are no loops top or bottom then the tension is probably right. Puckering can be caused by the stitch length being too long. The finer the material, the shorter the stitch. Perhaps that is the problem.